For years we've been told that the key to success in business is to rank well in Google. How to do this, how long it can last, or what to even do with that newfound web traffic are as varied in responses as can be. What SEO is: The strategy behind taking a legitimately useful site and showcasing it in a way that helps get it indexed and searchable by those whom it would benefit. What SEO is not: Taking a laundry list of "How to rank well" rules and gaming the system for some lofty traffic boosts. Creation is the core ingredient to all SEO. Regardless of what specific method is employed to improve a site's ranking factors, it can't be done well without creating something in the process. But there are a lot of methods to a strong search engine presence. Anyone selling a universal solution is probably something of a one trick pony. If that tool works, it likely works because you're in a non-competitive industry or got something right by accident. Neither of those conditions will last. This is part of the reason some people have to redo their entire SEO strategy when Google releases an algorithm update. They were throwing too much into one basket, and when Google moves the basket there isn't much momentum left. 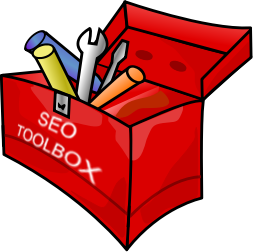 The solution varies by industry and by particular business, but generally speaking an SEO toolbox involves numerous tools both on-site and elsewhere. SEO is a genre of tools, or rather a way to look at a collection of functions that synergize to create a web presence that attracts new business. Which approaches are utilized for what amount of time varies by type of businesses, but it's important that variety is used. Each piece of SEO has a small impact, and the longest-lasting success online is victory through a hundred small wins. Write a great title for a sales page? Small gain. Have solid keyword density and use of images and other tags? Small gain. Are your directory listings correct and consistent? Small gain. Are you getting backlinks from other sites and publishing content around various places? Small gain. Et cetera. When considering an SEO firm to bolster your web business, look for a plan and someone with tools to properly measure the efforts. Having an avid toolbox of solutions and the ability to monitor it is the only way to stay ahead for long.